I am sure someone could put together a better post on this topic. I really don't have the time, but when I stumbled on these two items on same day I couldn't resist putting something down. First, take a look at the mathematical formula for the perfect wife. Please forgive the sexist slant to this, particularly today. I suppose a better title would have been 'mathematical formula for the perfect life partner,' but a silly article deserves a silly title, I suppose. 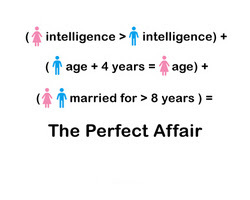 Next, take a look at how this has been adapted to be the formula for the perfect affair. It is left as an exercise to try to rehabilitate the above into something that actually could be said to make sense. These 'formulas' make some explicit assumptions about the genders involved, and hinge on the fact that they are restricting our attention to pairings that involve a single male and female. This restriction tells me right away that no real mathematicians could have been involved, since the first thing that they would have done is generalize the result. In either case, whether you are looking for happiness with the person you've publicly pledged yourself to, or the person that you are secretly breaking that pledge with, a key factor determining happiness (of the male, I assume) is that the woman is more intelligent than the man. Probably not too hard to arrange. Since this seems all very male-centric anyway, maybe the only truth that we can get out of this is that dumb men are happier in all cases. Notice how they helpfully translate the 68% to 7 out of 10 for us. Thanks guys! The vision of society that someone must hold in order to propose, even in a silly model, a central agency for allocating marriages is in keeping with one that would assume that someone who stays in a bad or even abusive relationship is more successful than someone who leaves. In any case, here's an example of really dumb research giving way to even more ridiculousness as it gets picked up by the press (and, mea culpa, probably giving way to something even worse when people start blogging about it).